For most people, exams are stressful. Whether you are worrying about your workload, anxious about performing or fearful about the future, it’s not unusual to feel this way. When under pressure our bodies respond by producing adrenaline – the fight, flight or freeze hormone. While this reaction is perfectly natural, and often necessary, too much adrenaline can cause unwanted symptoms such as sickness, dizziness and headaches. Stress can lead to trouble sleeping, a loss of appetite and can also affect our mood causing us to feel irritable, unhappy and even hopeless. You may hear people say ‘it’s not the end of the world’ but for some young people it can certainly feel like it is. Organise your workload. Prepare for your exams by setting yourself realistic targets to work towards and finding a revision style that suits you. Pace yourself. Give yourself plenty of time and revise in short bursts. Remember to take regular breaks between study sessions. Talk with your family, friends, tutors or teachers – share your worries with anyone that you find supportive. Recharge by drinking water and feulling your body with healthy food. Exercise can also help to release some of that extra exam tension. Rest. Make sure you are getting enough sleep and spending time relaxing. Try breathing techniques and practice mindfulness to keep calm and refreshed. Socialise with friends. Remember that you have a life outside of studying. Allow yourself some time out with others to have some fun! Reflect. ‘Failing’ exams does not make you a failure. You may have to take a different route to achieve your goals but setbacks can increase resilience and lead to unexpected and exciting opportunities. Take time to experience your emotions instead of making a snap decision. Explore other options. Resitting an exam, repeating a year, appealing a grade, entering clearing, taking a gap year or considering different courses, careers, apprenticeships and internships are just some of the options available to you. Ask for some support. Discuss your disappointment with those around you. Consider who you can contact for more advice; a teacher or tutor, a careers adviser or service. Care for yourself. Regardless of your results, you’ve worked really hard and this achievement should be rewarded. Practice self-care by planning something positive for results day. 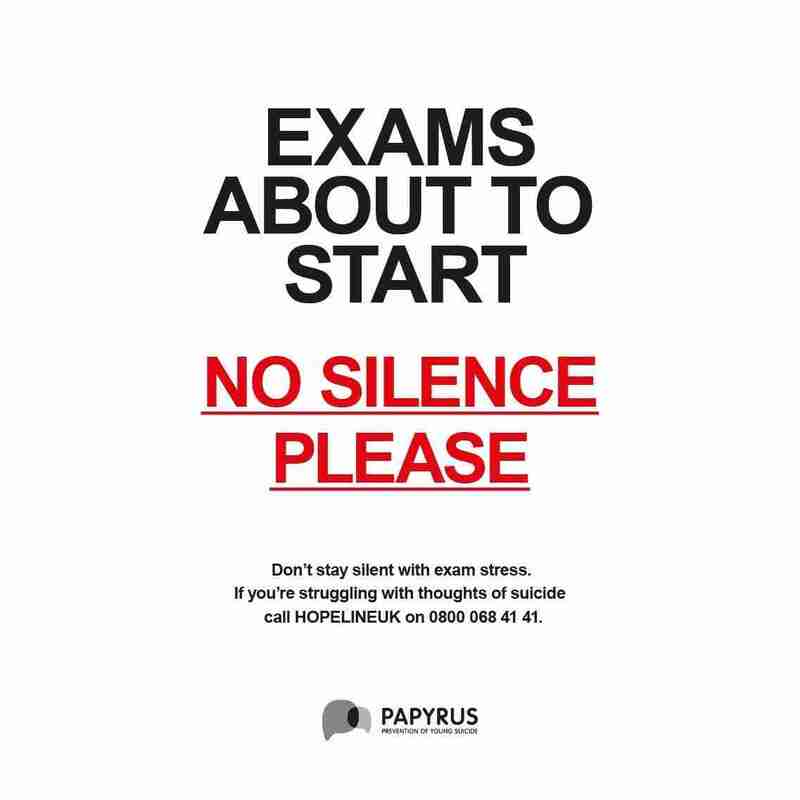 For some students, the pressure surrounding exams can feel overwhelming and can sometimes include thoughts of suicide. We urge anyone with thoughts of suicide to reach out for help. We also urge parents, teachers and others to reach in and give students space to share how they are feeling. With the right support, young people can stay safe from suicide and start to feel hopeful about the future. If you are having thoughts of suicide or are concerned for a young person who might be you can contact HOPELINEUK for confidential support and practical advice. Our Suicide Prevention Advisers are ready to support you. If you are a school, college or university and would like to support our campaign and raise awareness within your community, please click the link below to download the printable posters. Click here to download.